This is curling season in Canada. The Scotties Tournament of Hearts just ended, and starting tomorrow the Tim Horton’s Brier begins. Curling brings back memories of growing up and watching Sportsweekend and other sports programming on CBC on Saturday afternoon and weekends. Back then every weekend, there was a 1 hour curling program on every Saturday evening in winter. What was more memorable than the curling in some ways were the hosts. No they didn’t make you any offers you couldn’t refuse, but it seemed comical that all three hosts were named Don! 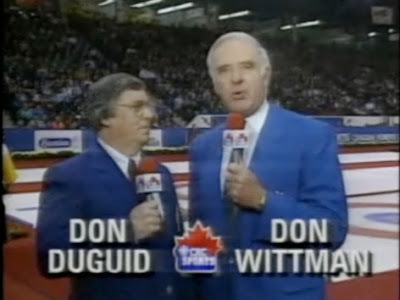 Don Wittman, Don Duguid and Don Chevrier. Curling is a big part of the canadian sports scene, and these guys introduced us to the likes of Al Hackner, the Wrench, Ed Werenich, and the ever so quiet Russ Howard. I’m not sure what they squeezed into their hour long show back then, but I remember watching religiously as a kid. I remember dad laying on the couch, me laying on the floor, with my feet over the furnace grate, and watching closely. Not only is it a fun sport to watch, but brings back great memories of growing up. Looking forward to watching more this weekend and next week!